The venerable Niagara Gun Show which is sponsored by the Sporting Clubs of Niagara takes place four times a year in St. Catharines, Ontario at the Merritton Community Centre. This past weekend saw the second show of 2016 take place, and as we deliver firearms courses in Niagara, GTAGunSafety.com decided to visit and post a review of this important event for the Niagara firearms community. Many Ontario gun shows are held during the day, often on a Sunday morning, and are packed up and done before the last sip of a brunch coffee. The Niagara Gun Show runs on Friday evenings, and benefits from the after-work crowd as well as those who vacation or cottage in the Niagara area. Attendance seemed to be quite good, and the floor had a steady flow of visitors. There were in the area of 70-80 tables for vendors, though many vendors had two or three tables on display. 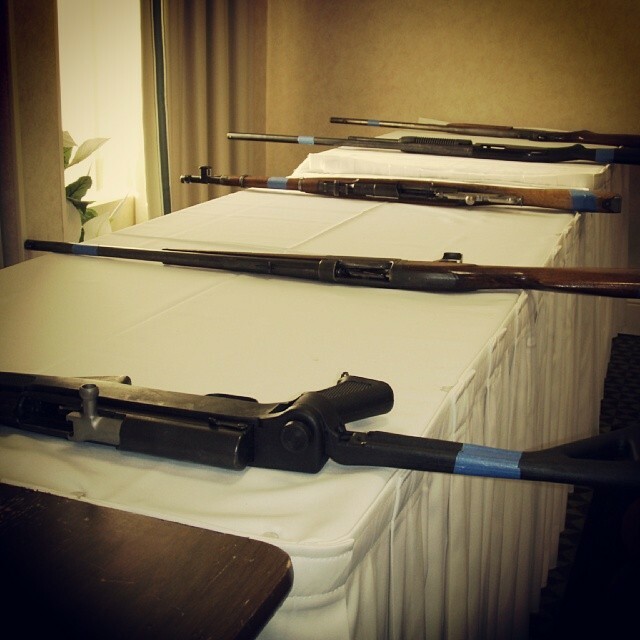 Some of the highlights included several tables of hard-to-find ammunition, military swords, vendors selling duck and turkey calls, and of course plenty of firearms. There was the ubiquitous Lee Enfield family of firearms, though many were “sporterized” adapted for hunting, but we spotted at least two Long Branch-marked SMLE’s, including one that was scoped and accompanied by an original WWII shipping crate. The entry fee for the Niagara Gun Show was a mere $5, and there was plenty of parking. The atmosphere was pleasant and convivial, and many of the visitors and vendors are regulars. One drawback is that most of those who were selling their wares could only take cash, with very few accepting credit card payments at the show. Overall we found the show a worthwhile event, and a great way to connect with others in the firearms community in Niagara. We look forward to the next one, scheduled for September 9!